President Obama's recent criticism of technology -- and of the iPad in particular -- is wide of the mark. NEW YORK ( TheStreet) -- President Obama's recent criticism of technology, including Apple's ( AAPL - Get Report) iPad, is wide of the mark -- particularly at a time when tech is helping to revive the U.S. economy. Earlier this year, research firm Forrester predicted that U.S. IT spending will grow 6.6% in 2010 to $568 billion, more than twice the rate of GDP. The president, however, fired a shot across the bow of the tech sector during a speech at Hampton University this weekend, warning that the latest gadgets are placing new pressures on American democracy. "With iPods and iPads and Xboxes and PlayStations -- none of which I know how to work -- information becomes a distraction, a diversion, a form of entertainment, rather than a tool of empowerment, rather than the means of emancipation," he said, according to the New York Post. Sure, any form of technology (including TV) can be a weapon of mass distraction, and new innovations do bring fresh challenges, but this is something that the government should embrace -- not resist. After all, Obama's election platform elaborately discussed an increased role for the government in cultivating and using technology. The tech-savvy president, an avid Blackberry user, also made expert use of the Internet and social media during his campaign, and was comfortable talking tech on a visit to Google ( GOOG. Obama's decision to single out Silicon Valley heavyweights Apple and Microsoft ( MSFT - Get Report) is, therefore, a strange one. Love them or hate them, the two tech giants are major employers who have played key roles in turning the U.S. into a technology powerhouse. They've also joined the likes of Ford ( F - Get Report) and GE ( GE - Get Report) among America's most recognizable brands in the pantheon of global consumer heavyweights. 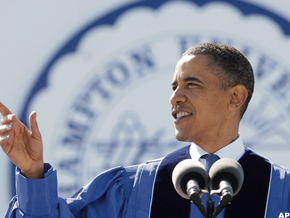 The president's comments at Hampton University have already prompted a slew of criticism on TheStreet's message boards. At least Obama has acknowledged the government's need to adjust to new technologies. "We can't stop these changes," he told students. "But we can adapt to them -- and education is what can allow us to do so." This should be highlighted as the most important part of Obama's speech. Technology can make government more transparent and provide citizens with better access to services. Whether this takes the form of online voting, White House blogs, or text-based emergency information, one thing is for sure: tech is something that can improve -- not impede -- the democratic process. >>Obama on iPad: Weapon of Mass Distraction?